Raising of our little adorable darling: Uniform! Thamizhini got her new uniform from her School. More than her, we were really excited to see her in Uniform. 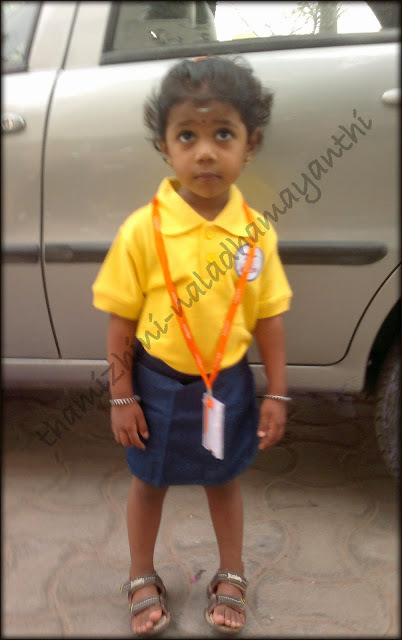 After a fussy start of week, Thamizhini was very excited to wear her uniform and go to school. She woke up in the morning and told that she does not want to go to school. I coolly asked her "then what about your uniform?" She though for a second and she was happily ready to go to school. I gave her bath and to my wonder she got ready in 15mins wearing her new uniform. She was happy and bit shy to wear that. I must say that she looked very pretty (yeah! as all parents) in her uniform. She showed her cute uniform to her Appa and Ayah. Check out the below video how she tells about her uniform and you can see that her legs are not standing still! That much happy for her Uniform. Her Daddy usually drop her to school and he captured the below video there. She was so cute while walking towards her school and from her style of walking, I could say that she started searching her Knowledge and Wisdom. Good job with the videos appa, especially the background music in the second one. :-) And Thanks to amma for continuing to record Thamizhini's milestones. Hey cool video... great work.. I have started a blog for my achu too... Can I give you a suggesion.. Just watermark the pictures and videos to avoid them being copied..